Matt McClain misses the friendships and the collaboration of working with a staff. 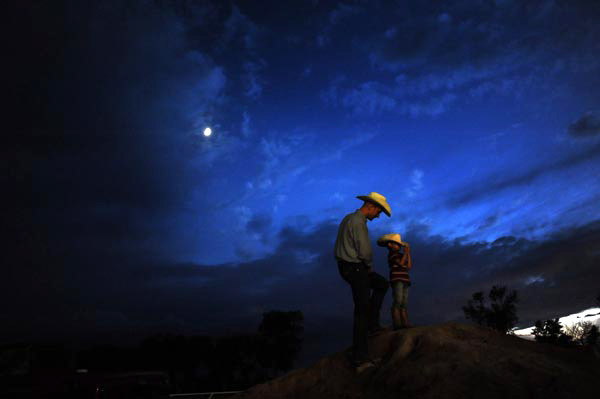 Josh Orrell tells his son, Benjamin Orrell, 4, to stop playing and come home Saturday on June 27, 2009 after a rodeo in Hugo, Colo. The day Scripps Howard announced it was closing its flagship paper, The Rocky Mountain News, I was on assignment on the far western part of Colorado. I was working on a continuation of a series I had photographed the previous year on the booming natural gas industry in the state. This time around I was chronicling the economic slowdown of the same industry that seemed to be surging without a ceiling. While accompanying a recently out-of-work oil and gas worker to the local unemployment office in the morning, I was struck by my own uncertain job prospects. Since that bleak and bitterly cold December day, nearly three months before Scripps announced that the paper was for sale, there had been a swirl of rumors of when and how the end would come. Some of us were even swayed with the false report that a deal had been struck and there was an actual buyer. That story was short-lived and in its place were rumblings that were soon be greeted by corporate representatives who would deliver the unhappy news. Returning to my hotel room after the shoot at the unemployment office, I started sending my photos back to the office. I received a text message from a co-worker saying that it was going down and to give a call. There was no mistaking what the cryptic message meant. Asking whether or not I should finish my work or just drive back, I was told that the story I was working on had been scratched and to begin the four-hour drive back to Denver. That was one of the longest trips I had ever made in my life. So many thoughts swirled in my head. Would I ever work for a newspaper again? How long would newspapers exist? Was there still a place for meaningful journalism? What would freelancing be like? The next day we turned in our company equipment. That was the first time in my career I had been without a camera. I felt stripped down to my very core. A piece of my identity and purpose in life seemed to be missing. In the days that followed, I started a new phase of my career in journalism, the life of a freelance photographer. This new journey began by having to buy all the necessary equipment, laptop, cameras, lenses, etc... These are things you never would have to worry about if you’re working as a staff photographer. 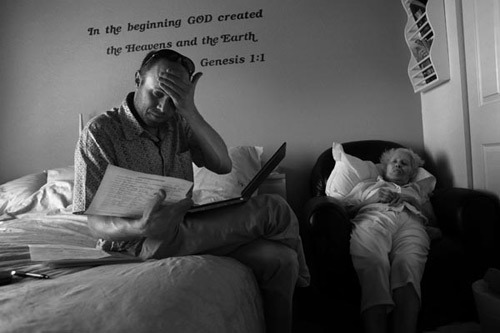 Dr. Thomas Lally shows his frustration as he looks at past paperwork on the medical history of Jennie Rodriguez, 97, as she lays in a chair in her daughter's Denver metro area home Wednesday 06/17/09. What I have learned in the following months of the paper closing is there's no right or wrong way to be a freelance photographer. The majority of my fellow Rocky Mountain News photographers are still working here in Denver. None of our paths have been quite the same. Some are pursuing video production while others are breaking into the wedding market. The other portion is seeking primarily editorial and commercial gigs. I began my post-newspaper career working on two photo stories I had wanted to do before the end of the Rocky. This gave me a chance to devote as much time as I wanted toward meaningful journalism. It also allowed me the opportunity to immerse myself in work and try to divert my thoughts from what had happened with the paper and the gravity of the situation. Aside from learning by my own trial and error, the most valuable advice have come from other freelancers. I find myself asking as many questions as I can and welcome any insights people are willing to share. It's a constant learning experience with ups and downs and moments of uncertainty. I will always have the love of connecting with subjects and telling their stories, despite all that has happened this year. My love and passion for photography is greater than ever. There are so many things a newspaper offers that I feel is missing in this current phase of my photographic career. The security of a steady paycheck, the friendships and the collaboration of working with a staff, and the feeling that you are doing something truly important for a community. Those are the things I miss the most.